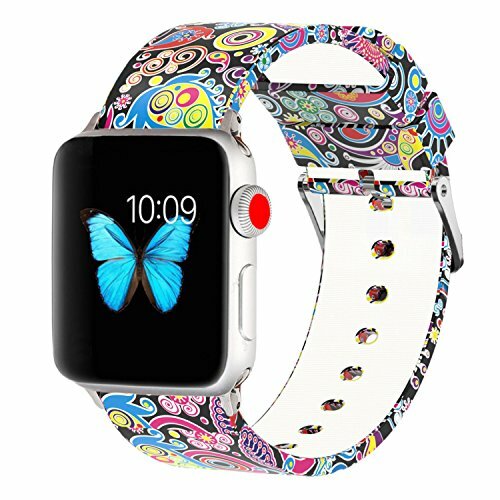 Band compatible with Apple Watch: compatible with iwatch series 3 series 2 series 1 all versions 38mm and 42mm,over 12 printing patterns for choice. Printing Patterns:gives your watch a colorful outlook,makes it fashionable and outstanding,perfect for daily wearing,sporting and party. Material: made of soft silicone, comfortable and durable; metal clip at the end of the band can help you adjust the band to the size you feel most comfortable; comes with Lugs on both sides, which lock onto watch precisely and securely. Compatible Wrist Circumference: 38mm band fit for 150mm-215mm (5.90\"-8.46\") wrist, 42mm band fit for 155mm-220mm (6.10\"-8.66\") wrist. 30-day money back and 100% customer satisfaction guarantee, anything we can help with, please kindly let us know, thank you very much for your great support and understanding.